David Gardiner and Associates contributed to a groundbreaking study released today that ranks all 50 states based on the ease with which companies in the retail and information technology sectors can procure renewable energy and urges state governments to promote customer choice of renewable energy. 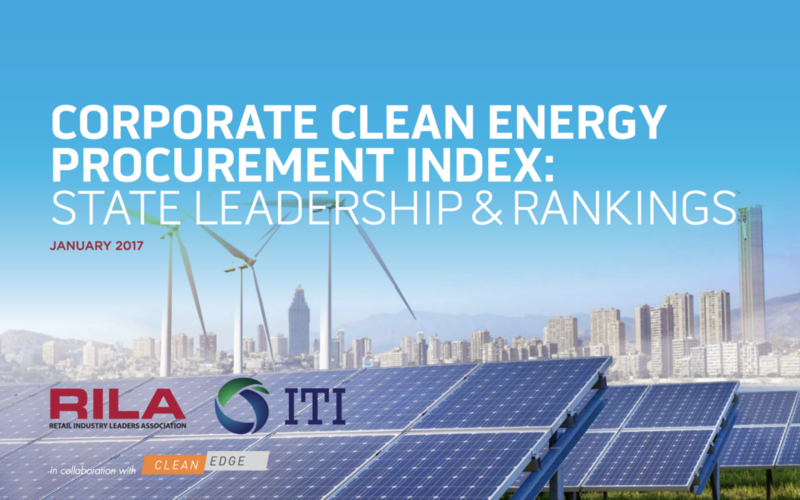 The Corporate Clean Energy Procurement Index: State Leadership & Rankings, released by the Retail Industry Leaders Association (RILA) and the Information Technology Industry (ITI), concludes that states that enable investment in clean domestic energy production are most likely to attract America’s largest job-creating businesses. Retail and tech companies such as Amazon, Apple, Facebook, Google, Microsoft, Target and Wal-Mart are among nearly half of the Fortune 500 companies seeking to locate operations in states with clean energy production due to fossil fuel price volatility and pollution concerns. To keep tabs on other news related to large customer clean energy procurement and state customer choice policy, follow @CustomerREVO on Twitter.